The 2015 Effie Awards Poland Gala took place at the Grand Theatre-National Opera in Warsaw on Monday October 12. 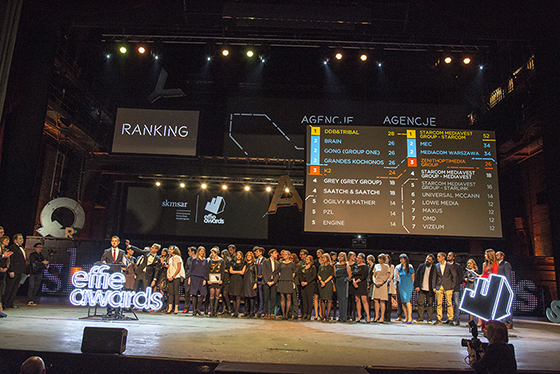 The Jury, which was chaired by an independent expert, Mr. Sebastian Mikosz, honored the most effective marketers of 2015. The Awards were hosted by the Marketing Communication Society SAR. The Grand Effie went to Wirtualna Polska for their #HAPPENSINPOLAND campaign, and there were 9 Gold Effies, 20 Silver Effies, and 19 Bronze Effies awarded. The entries in the 16th edition of the Effie Awards Poland were submitted in 21 categories. The work of the various marketing agencies and advertisers was evaluated by a panel of 80 judges under supervision of 6 leading judging groups, chaired by Mr Sebastian Mikosz.